Flower Camping Le Conleau is a 4 star campsite located in Vannes in the Brittany region of France. Flower Camping Le Conleau is a lovely 4 star campsite that benefits from a truly wonderful setting on the outskirts of Vannes along the Conleau peninsula. The campsite overlooks the estuary and the Gulf of Morbihan and its peaceful yet convenient location is ideal for those wishing to explore the surrounding areas. The stunning coastline can be explored via the coastal footpath where you can see nature at its best whilst further inland you can explore the historic city of Vannes. If you want a campsite with plenty of great activities both on-site and also nearby then you’ve certainly come to the right place. The campsite has a comprehensive range of activities available and the kid’s clubs are very popular, however the main benefit is what’s available nearby. The surrounding waters are perfect for those interested in water sports; kayaking, canoeing, sailing and diving are on offer, whilst there are some fantastic cycle and hiking tracks and trails nearby and golf courses and other outdoor activities within a short distance. The nearest beach to Flower Camping Le Conleau is around 500m away, it can easily be walked to and has lifeguard cover during the summer months which makes it perfect for families of all ages. This however is not all you get when you stay here. You’ll also find a sea water swimming pool at the same location which is just fantastic during the summer months. With the beach and seawater pool you may be forgiven for thinking that Flower Camping Le Conleau wouldn’t have a swimming pool however you’d be wrong. The campsite has a very pleasant heated covered pool, paddling pool and sun terrace just waiting for you to try after a day of fun. Flower Camping Le Conleau campsite offers a comprehensive selection of activities and facilities on site and also nearby to ensure you have a fantastic family holiday. On-site activities at Flower Camping Le Conleau campsite include a playground, bouncy castle, volleyball court, boules, cycle hire, table tennis, cycle hire, canoeing and kayaking. Facilities available at Flower Camping Le Conleau campsite include WIFI, restaurant, pizzeria, snack bar, takeaway, bar, groceries, animation team, games room, tv room, washers and dryers. 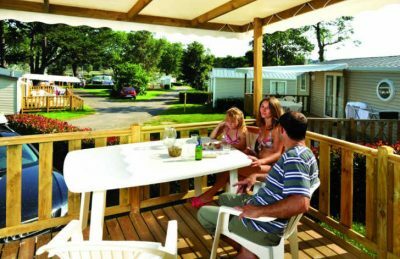 Accommodation at Flower Camping Le Conleau campsite includes a range of 2 and 3 bedroom mobile homes that are available from Brittany Ferries.